"What is E=mc2 of this century? ", our son Kabir asked me a few days after we watched the NOVA film "Einstein's big idea" together sometime last year. I thought about it for a few moments and said, "Psychology is the physics of 21st century, Kahneman is the Einstein and his work on happiness is like E=mc2". My answer and speed with which it came surprised me more than it surprised Kabir. I was clearly under the spell of Kahneman. Who is this Kahneman? And what is his work about? 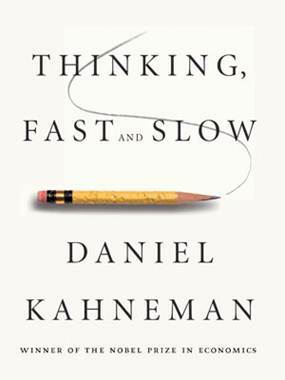 If you want to know, your best bet is to read Nobel Laureate Daniel Kahneman's bestselling book "Thinking, fast and slow". It has come out a couple of months back in India. 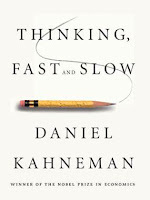 It is a landmark among the psychology literature intended for layman, more specifically about intuitive thinking and decision making under uncertainty. It covers a vast spectrum. Let me articulate a few nuggets of wisdom from it. Answering an easier question: When I look back at my answer to Kabir's question, it is clear that the answer was given off-the-cuff. In fact, I was in no position to answer the original question because I am clueless about most of the recent breakthrough developments in various sciences including those in psychology. Then what happened here? Kahneman explains it in chapter 9 titled "Answering an easier question". Whenever we are asked a question whose answer we don't know, the fast thinking mode answers an easier question. And unless the slow thinking mode checks & rejects the answer, it is given out like it happened with me. In my case the easier question that got answered was, "Among the scientific results I know, which one appeals to me the most?" Kahneman calls such shortcuts "heuristics" and we use them all the time. They work mostly and trick us real bad occasionally. When we are asked, "How happy are you with life these days?" we tend to answer the easier question, "What is my mood right now?" Expert intuition: when can we trust it? I wrote an article last month about mathematician Srinivas Ramanujan and the marvels of his expert intuition. The article also highlighted how the intuition tricked Ramanujan occasionally creating incorrect results. In chapter 22 which is titled "Expert intuition: when can we trust it?" Kahneman presents the exact criteria under which experts develop real expertise. You acquire skill when (a) you have an environment that is sufficiently regular to be predictable and (b) you have an opportunity to learn these regularities through prolonged practice. In some cases like that of stock analysts, the environment isn't sufficiently regular. On the other hand, chess players and basketball players do develop real skills. Illusion of understanding: Kodak filed for bankruptcy protection last month. All the related stories published in Economist, Wall Street Journal, Wharton School of Business, an HBR blog had one thing in common. None of them contained the phrase "bad luck". Most of them sited some story or the other related to poor management decision making, the most common being the Kodak's invention of digital camera and how Kodak didn't pursue it's development etc. Implicit in these articles was an assumption that bad management decisions cause bad outcomes like bankruptcy and randomness or bad luck plays insignificant role. Kahneman calls these generalizations where randomness is substituted by causation "illusions of understanding" (chapter 19). It stems from 3 things: (1) We believe that we understand the past. However, in reality, we know a story of the past constructed from very limited information easibly accessible to us. (2) We can't reconstruct the uncertainty associated with the past events. It leads to things like the HBR blog suggesting Kodak should have created a photo sharing social network. (3) We have a strong tendency to see causation where there is none. Many times a single story such as Kodak's digital camera story is good enough for us to label Kodak management as the root cause of its debacle. I don't know how much of strategy literature suffers from "illusion of understanding". Kahneman's law of happiness: Ask yourself "How special is your car to you?" and then ask yourself "How much do you enjoy the commute?" Psychologists have found a decent correlation (0.35) between the first question and the blue book value of the car. And, they have found zero correlation between the second question and the blue book value of the car. Such observations have led Kahneman to formulate the following law - Nothing in life is is as important as you think it is when you are thinking about it. Your car's importance to you is exaggerated only when you think about it. Unfortunately, you spend significantly more time driving it than thinking about it. Kahneman's confession about the book: "I don't think reading this book will prevent any of you from making any significant mistake. Because even writing it hasn't helped me." said Kahneman in an interview. Then what does he hope to achieve? Well, Kahneman wants to see more sophisticated water cooler gossip about biases in decision making, mostly of others. I love the book and I am sure I will come back to it again and again in the future. A Quality circle is a volunteer group, a team of four to seven workers with the possible inclusion of their supervisor that understood the methodology of identifying and solving problems. For example, one of the teams named “Gold Star” had five members aged between 23 and 55 years. Two of them were 10th standard, two had PUC and one had Diploma in Mechanical Engineering. Four of them were machine operators and one of them was a Quality auditor. The team had a patron who was a manager. From their presentations, following things struck me as worthy of emulating by innovation programs in other sectors. 1. Team activity with gamification: QC circle is a team activity. Contrast this with the suggestion schemes where individuals are the heroes. Each team identified problems, set goals and systematically went about solving them. Weekly/fortnightly one hour was reserved for this activity (e.g. every other Wed 3-4pm). A typical project lasted 2 to 5 months. Each team had created an identity – some called themselves Kadamba warriers, some were Red Chillies, others were New Millennium etc. Each team competed against others within the company to do better at innovating within their environment. In at least some of the participating companies it was a decade long initiative with 100% participation as shown by the picture below. 2. 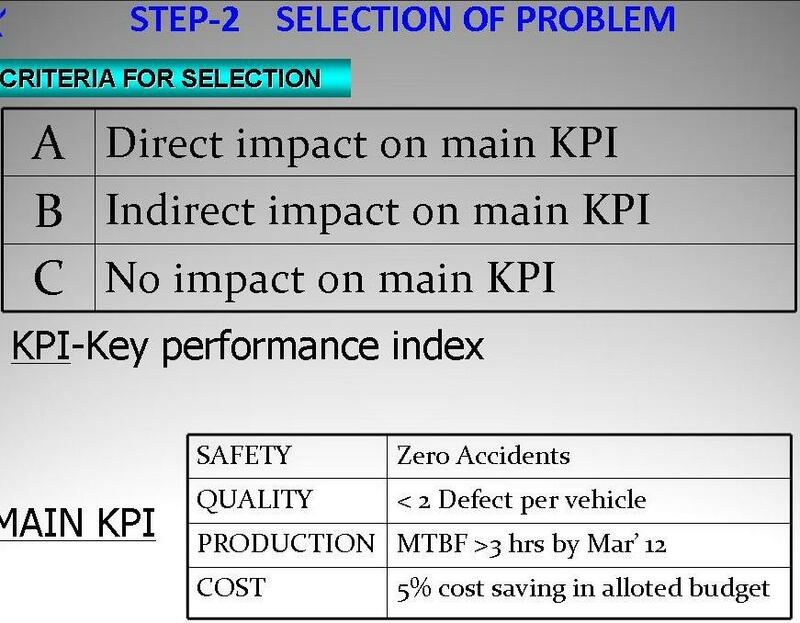 Problem selection criteria: Selecting which problem to solve is given a lot of importance in QC activity. All the teams presented the list of problems they identified first – about 50 to 70. A commonly used technique for selecting the problem was called SQPC analysis. It meant to rate each problem on 4 dimensions – Safety, Quality, Productivity and Cost. In some cases these parameters were crisply defined. 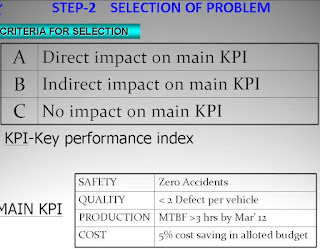 For example, safety – zero accidents, quality - < 2 defects per vehicle, production – MTBF > 3 hrs by Mar ’12, cost – 5% saving in allocated budget. See the picture. Depending upon the scope of innovation, this criterion may vary. However, it makes sense to identify some criteria in selecting problems to solve. 3. Genchi Genbutsu: This is a Japanese phrase meaning “go and see for yourself”, which is a central pillar of the Toyota Way. Genchi genbutsu is sometimes referred to as “get your boots on”, which has a similar cadence and meaning. 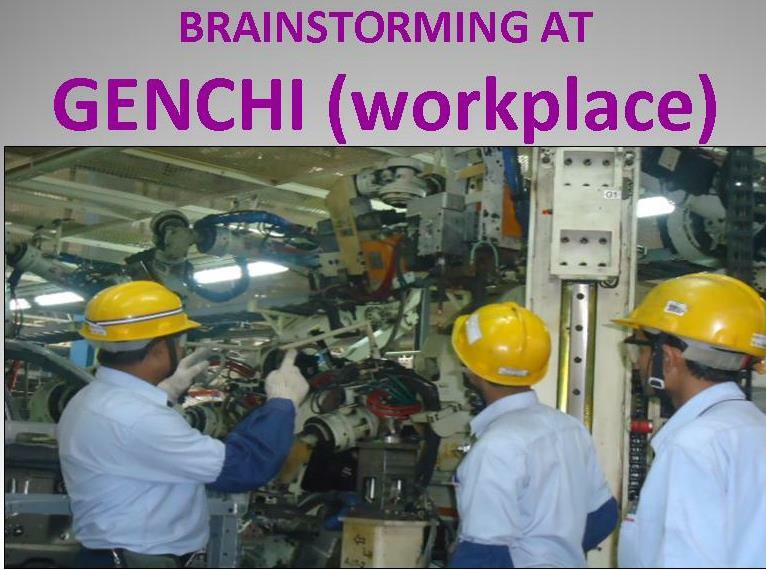 Toyota-Kirloskar team presented how they did brainstorming at workplace to identify and solve the problem better (see the picture). This is similar to immersive research of P&G. My learning: I derived following learnings for the innovation programs: (1) They can introduce innovation as a team sport - it just makes it more fun. These teams could be Communities of practitioners (like Java / SAP developers) or theme based teams (e.g. sustainability). The teams could compete based on a simple scoring mechanism (no of ideas submitted, no of prototypes demonstrated, no of ideas implemented, business impact etc). (2) Organizations can help innovators in developing a challenge-book. Similarly, organizations can define strategic priorities for selecting problems where it is willing to make non-trivial investment. These could be specific technology areas, customer segments or consumer/social/regulatory trends (3) Organizations can make “immersive research” an important aspect of problem understanding and solving. For example, Intuit’s “follow-me-home” or P&G’s “Living it, working it” programs do this. Note: Thanks to Prof. Rishikesha Krishnan for the suggestion to make the learning explicit.